Click type to jump to that section! We now have a logo at the top of the page that characterizes the brindle pattern. Notice the striping is drippy looking and not regularly spaced. There is often a swirl over the hip, and vertical striping in the flank, which is not usually seen with other dilutions or sooty striping. The Slideshow has now also been updated. It is split into two portions: One for full patterned brindles, and the other for partial or indeterminate patterns. Pictured are 3 very nicely marked brindles and a foal owned by Denise Charpilloz. She has purchased my brindle producing stallion to breed to her mares. We're keeping our fingers crossed for more of those brindle stripes. 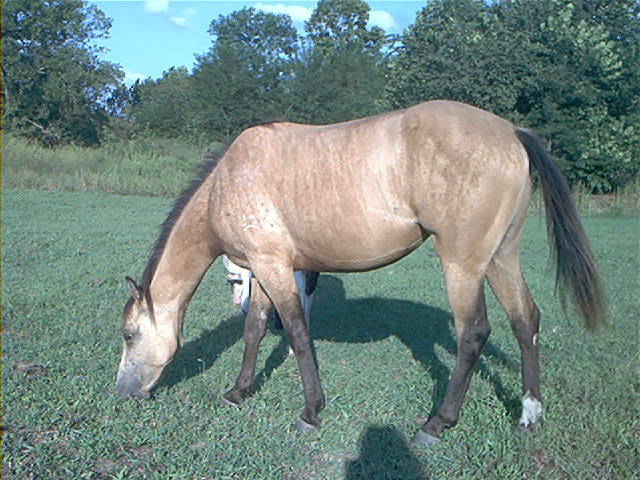 Janelle Johnson just sent me a picture of her 2005 filly from the brindle mare Im A Star Moon Bar. Janelle says the filly is almost a carbon copy of her dam. Janelle had leased my brindle producing stallion in previous years, so she has a number of foals for sale. There is a link to her webpage in the breeders section and/or at Just A Splash of Paint. In relation to recent articles on the Brindle pattern, please keep in mind that Chimerism is NOT the only source of the Brindle pattern in all Brindle horses. I have had two lines in which the pattern has been inheritable. The mare Brenda Batty Atty, has had 3 brindled offspring (3 brindled of 5 total foals). Also, the mare Im A Star Moon Bar (3 brindled of 5 + 1 carrier), and her son Ima Star Brindle Bar (5 brindled from 7 breedings while I had him), have all had brindled foals. I have also had reports of Brindle offspring from others. Hopefully I will be able to get to an update of the table soon. Articles written by Christine Hamilton on Chimerism as an origin of some brindle patterns have appeared in recent magazines. I understand the March issue of "America's Horse" has an article by Christine. There was also an article in the November 2006 issue of "Equus," and in the February 2006 issue of the Quarter Horse Journal, in an article called "One in a Million". 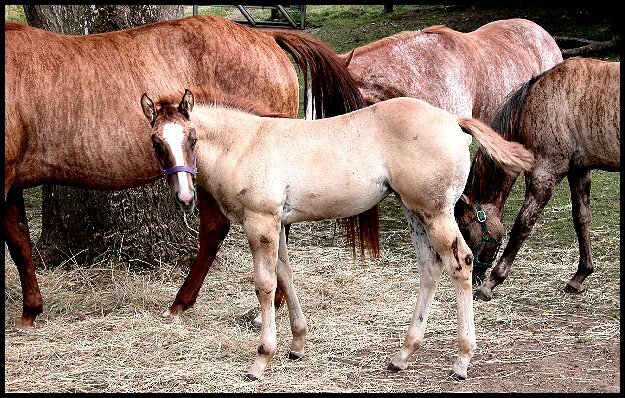 The article detailed the work headed by Cecilia Penedo, PH.D., at UC Davis in the DNA testing of a foal by Dunbar's Gold out of Sharp One, both of which exhibited a phenotypical (outward appearing) brindle pattern. Extremely rare, chimmerism has been documented in other species, and is now documented in Horses as a result of the work at UC Davis. Dr. Cecilia Penedo also presented her findings at The Horse Genome Mapping Workshop that was held on Aug. 22 in Port Seguro, Brazil. There is a new registry for brindle horses only, started by Kay Isaac in 2008 called the American Brindle Equine Association. She is registering brindle horses, donkeys, mules, ponies, and miniature horses, but no zebra or zebra hybrids. She says her registry will have a searchable database, distance awards, medals, and prizes. Contact her for more detailed information at e-mail, or you can write the A.B.E.A. c/o Kay Isaac, PO Box 21, Shoals, IN 47581. There is a registry for brindle horses started by Anita Garza in 1998 called the Brindle and Striped Equine International. She is registering brindle, heavy dun factor, "netting", horses, zebra hybrids, zebras, donkeys, mules, ponies, etc. There are different divisions for each. She says her registry will have a Register of Merit awards program. Contact her for more detailed information at 409-793-4207, e-mail, Anita Garza, 11819 Puska, Needville, Texas, 77461. Some brindle horses can be registered with the IBHA as "brindle dun". They have had the category "brindle dun" since approximately 1971. Unfortunately they aren't able to produce a list of horses registered as this color since most occurred prior to computer searches being generally available. Visit their website for more information, or contact: (219) 552-1013, International Buckskin Horse Association, PO Box 268, Shelby, IN 46377. The International Striped Horse Association started by Mary Jagow in 1988 has been closed in March 1999 as per Mary Jagow. This slideshow was last updated November 5, 2008. To see if new pictures were added since the last time you were here, you may have to "refresh" or "reload" your screen. Remember, these photos in the slideshow are for informational purposes only, in order to educate people on how variations in the Brindle pattern can look. Most of these photos are copyrighted and cannot be reproduced without permission. There is a link at the bottom of the page to a photo that can be printed out and distributed to your friends if you wish. 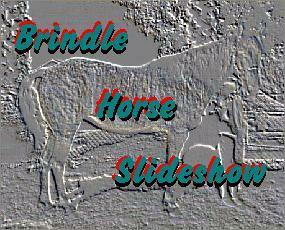 If you have trouble with the slideshow, the pictures can also be viewed through our Table of Brindles. The photos on the table, even though small, take a while to load because they are links to larger photos, and the larger photos are the ones that are being loaded. However, you can scroll down and read the table, and click on the unloaded photo box to jump to that larger picture if you wish. If it shows the photo as being not found, it is one of the photos I haven't completed yet. Some browers may not play the show automatically, so you may need to click each picture to proceed. Also, you may just click each picture if you want to scroll faster through pictures you have already seen. We are looking for other Brindle Horses, or information on the Brindle pattern, for a study. Brindle in Horses is very rare. Most people are more familiar with the Brindle pattern in Dogs or Cattle. If you come across any Brindle Horses, or information on the pattern in reference to horses alive or deceased, please let us know. The first record of the Brindle Pattern in Horses seems to be by J.A. Lusis, in the publication Genetica vol.23, 1942 . In the article on "Striping Patterns in Domestic Horses", he details a Russian cab horse from around the 1800's, that was preserved and put in a museum. Reports of Brindle or Brindle Dun patterns from the 1860's to 1870's in the Criollo horses of South America have been documented by writers such as Marrero, Pereyra, Solanet, and Odriozola. Many people confuse the Brindle pattern with Dun Factor markings (stripe down the back, barring on the legs, and occasional regular-spaced striping down the ribs). At one time, it was thought Brindle was a just a variation of Dun Factor. Indeed, there have been many examples of horses that were probably carrying both Dun Factor and Brindle. However, as can be seen from pictures of numerous Brindles in our slideshow, many do not have any Dun Factor markings whatsoever, indicating the two patterns are probably distinct genetically. Click highlighted type to compare Dun Factor and Brindle. The most recent book mentioning the Brindle Pattern is Jeanette Gower's book Horse Colour Explained, 1999 , Kangaroo Press, available thru 20 Barcoo Street, East Roseville NSW 2069. Another book is Phil Sponenberg's book on Equine Color Genetics, 1996 , Iowa State University Press, Ames, Iowa, 50014. Another good book on genetics, is Ann Bowling's new book Horse Genetics, 1996 , CAB International, available thru Oxford University Press, 2001 Evans Rd, Cary, North Carolina, 27513. You may e-mail me at jsbatteate@aol.com Click here to e-mail me! 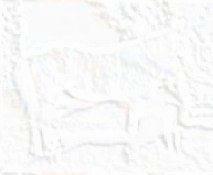 Click this type for a picture of a Brindle Horse with contact information you can print.